This all creatures animal exploitation photo gallery about Orcas is being presented to show the public the difference between the cute animals we see in advertising and picture in our minds and the reality that exists in the world. (Orca Exploitation - Entertainment - 05) The marine park industry is a lucrative business at the expense of an animal’s life and is a perfect example of man dominating and exploiting nature in the name of profit. 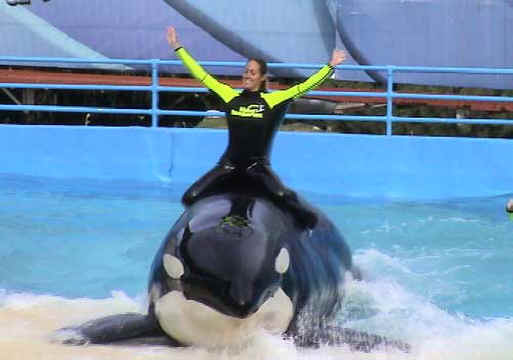 Counter to the advertising we've seen, there is nothing educational about these orca tricks, because this isn't the way they live or behave in the wild. The only thing these parks teach is how to exploit animals for profit. If people stay away from these marine parks, this evil will stop.